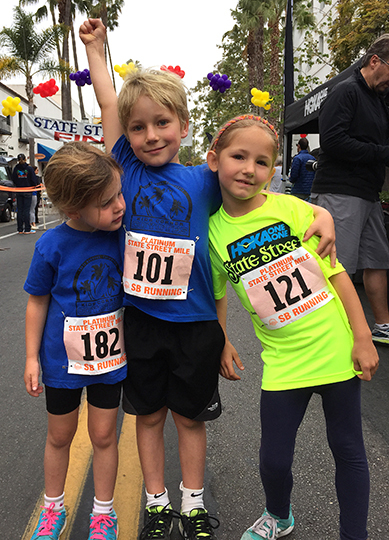 Last weekend was filled with multiple exclamation points as many of my friends and I participated in the Gaucho Gallop, a local 5K put on by the University of California on its beautiful Santa Barbara campus. We were all looking forward to participating in this race for a variety of reasons, but when we woke up on Saturday morning, we were greeted with less than ideal conditions. Can you say cold, blustery wind? What’s a fair weather Californian to do? And we’re not talking just a little breeze. It was the kind of wind that had sponsors bungee’ing down their tents so they wouldn’t fly away. Regardless of Mother Nature’s extra little test, it was a GORGEOUS morning filled with fun, friendship and fabulous competition. 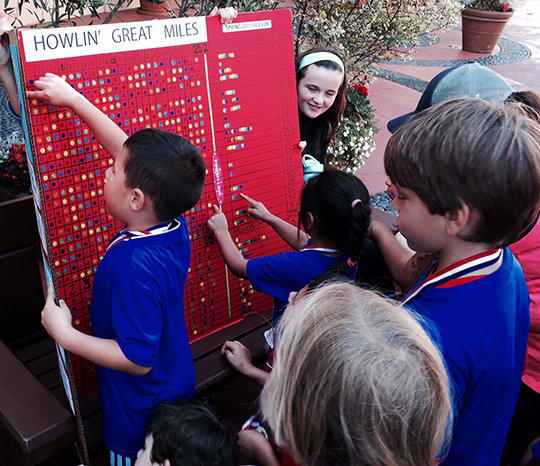 Most exciting was kicking off the spring season of Kids Corner Coyotes, a youth running club I coach with Nash Jimenez. It’s impossible not to be filled with joy when being surrounded by so many eager young faces falling head over heels for the sport we all love so much. 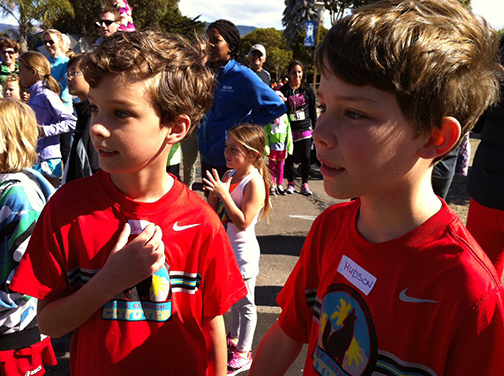 Doubly exciting was seeing so many of our Roosevelt Running Club families participate in the 5K race. They didn’t just participate either, they ROCKED the course. 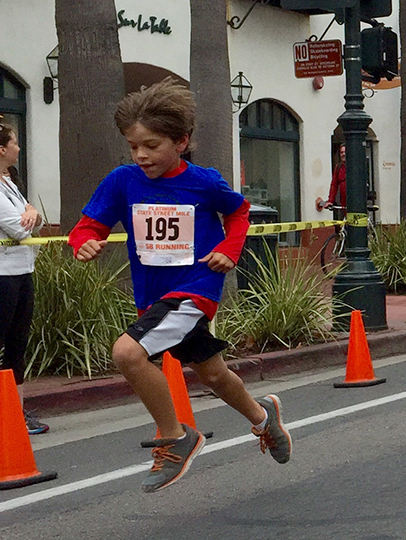 One of my 8-year old runners (#52) finished in a blistering 23:05 (7:26), and each of these other rock star runners pushed themselves way beyond their comfort zones, and ran terrific races too! 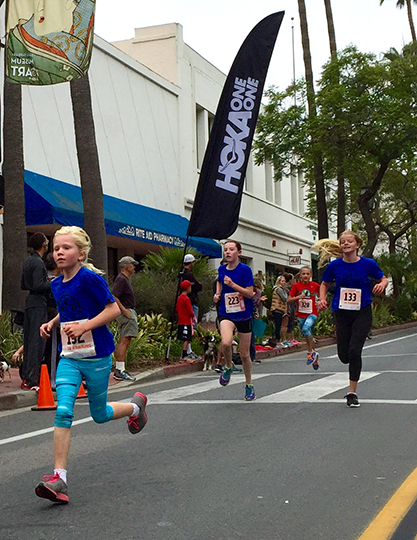 I was especially excited for my daughter (#245), who took 10 MINUTES off her last 5K finishing time. EPIC! #proudmamamoment. Thank you Stella for being her awesome running partner! 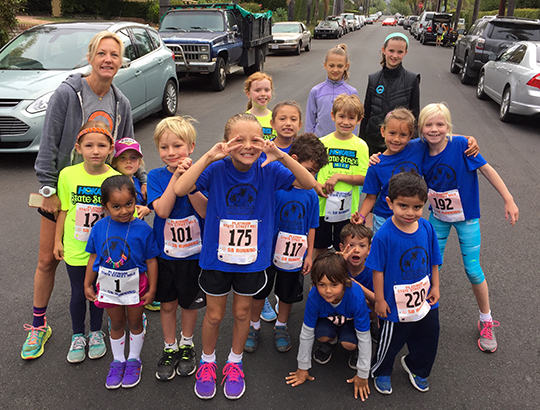 Some of our Roosevelt Running Club members celebrating their hard work after the 5K race. My race was about redeeming myself. You might remember the last race I ran was less than stellar; I didn’t “race” race and it left a hollow, disappointing feeling in my gut. I didn’t want to let myself down again so this time I woke up with fire in my belly, ready to leave it all on the course. And that’s exactly what I did. I ran the fastest 5K I’ve ever run, despite the wind, finishing in 23:30 (7:34 pace). I have to try to keep up with #52, after all! Most exciting? This time I didn’t finish 6 minutes behind my closest GP competitor. I finished 6 seconds behind her. I think I can. I think I can. I think I can. I’m slowly building momentum, inching closer to where I believe I can be, knowing I still have A LOT of work to do. Another highlight was seeing one of my Roosevelt moms beaming after the race. She was riding high on sweet momentum as she knocked off even more time from her finishing goal. Way to go, Debbie!! I’m so happy for you, and proud of you!! 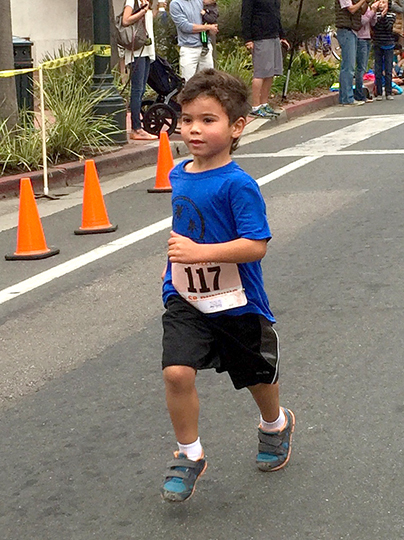 Debbie started running again because she was so inspired by what her boys were doing (yep #52 is her speedy son, and her older son is blistering fast too). Now, not only are her boys inspiring us all, she is too (especially me)! The topper to all this was being surrounded by a gaggle of happy, healthy, motivated people. Runners are nothing but a bundle of positive energy. After all, optimism is the fuel that keeps us going! Momentum is its sweet, electrifying byproduct. 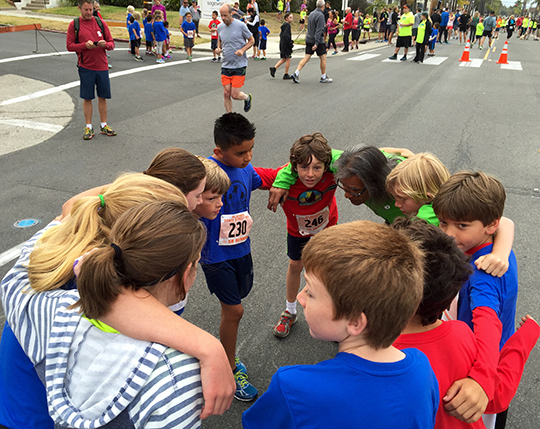 Speaking of sweet momentum, I have one last tidbit to share with you… several weeks ago a writer contacted me wanting to do a story about the running program my husband and I started at my daughter’s elementary school, The Roosevelt Running Club. Needless to say, I was bowled over by his interest in our program, and filled with gratitude for all the people that have, and continue to, make this program what it is. 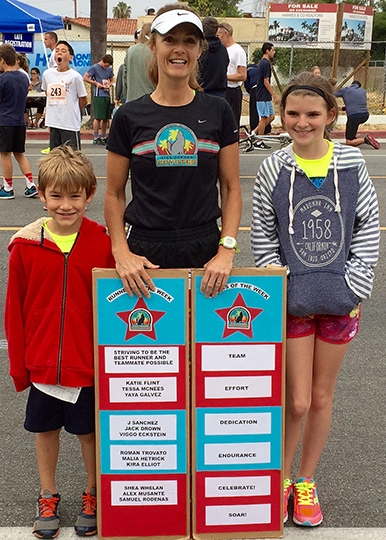 This kind of magic can only happen with the support of parents and athletes who want to pay it forward for the next generation of runners. 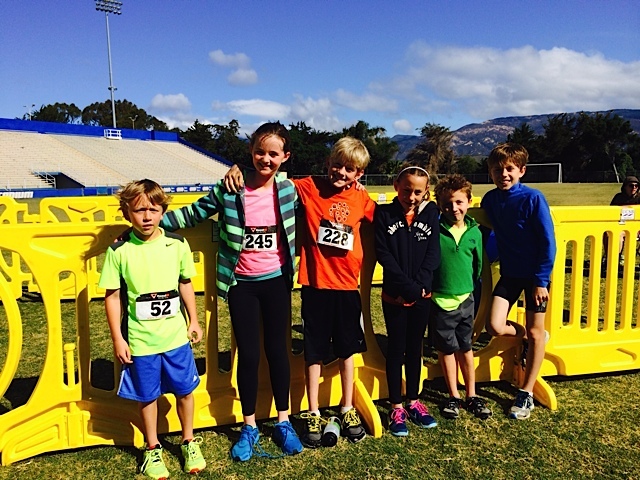 Here’s a link to the story if you are interested in seeing what we’re up to: http://presidiosports.com/2014/04/aaronson-establishes-roosevelt-running-club/ (or click on the photo below). 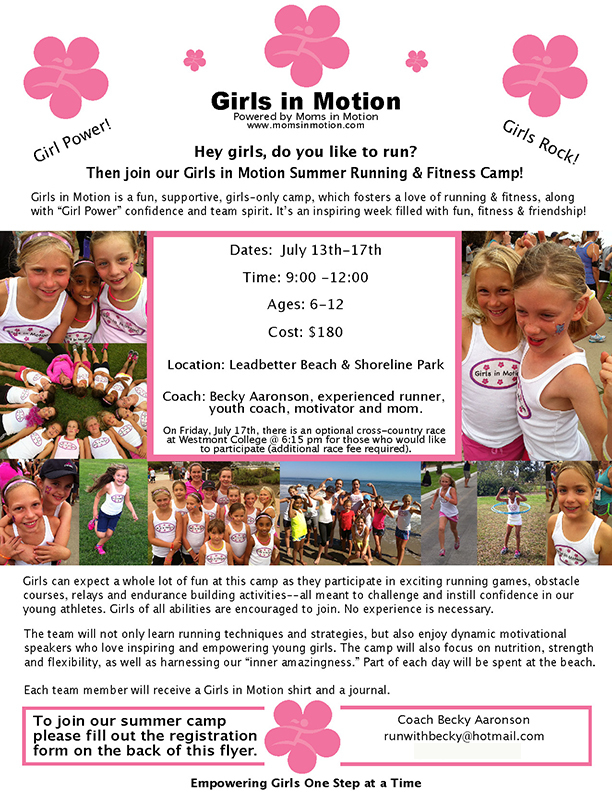 So tell me, as spring heads quickly toward summer, are you starting to feel momentum with your running? Are your feet being lifted a little higher and faster from the power of your fabulous running community? What’s your story?